To do business as a money transmitter in California, you need to get a license from the state Department of Business Oversight (DBO). The application process for this license is handled by the Nationwide Multistate Licensing System and Registry (NMLS). The application process is quite straightforward, though it requires that you prepare and complete a number of forms and documents. This also includes posting a money transmitter bond. See below for a breakdown of the application process for a money transmitter license in California! Who needs a money transmitter license in California? 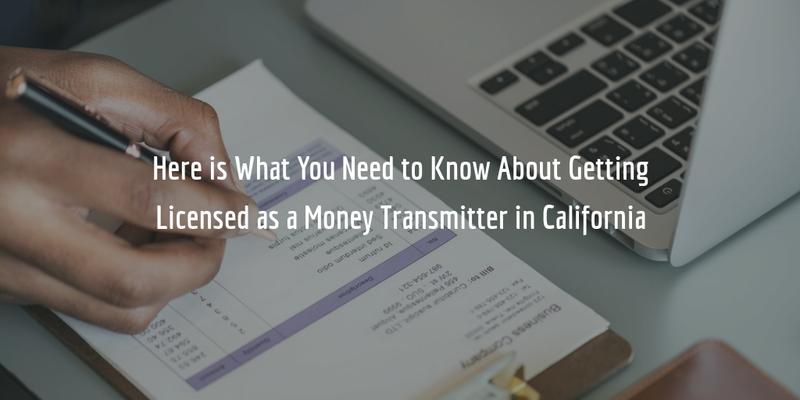 Chapter 1 of the California Money Transmission Act defines money transmission as: selling or issuing payment instruments or stored value, or receiving money for transmission. To do any of the above, you will need to get licensed as a money transmitter. Applicants for a money transmitter license in California are advised to arrange a pre-filing meeting with staff at the Division of Financial Institutions. This meeting will help you clarify any questions regarding the license and the application process you may have. When arranging the meeting, you will also be provided with a number of pre-filing materials which you can study to prepare for the meeting and application. The application fee for this license is $5,000 and is not refundable if your application is not complete. This is yet another reason why you should consider arranging this meeting! While it is the DBO that issues these licenses, you need to apply for your license through the NMLS. You will first need to register on the NMLS website to obtain an account. Once you have your account, you can log into the system and begin with your California money transmitter license application. To apply, you will need to complete several forms within the system itself, upload others, as well as submit some outside of the NMLS by mailing them to the DBO. You can get a detailed breakdown of what all these must include from the applicant checklist provided by the NMLS. As already mentioned, you will also need to pay a $5,000 non-refundable application fee. You will also need to pay an additional $15 fee for every credit report issued for a control person. Once you are done with completing and submitting all of the above to the NMLS, you will need to wait for it to be reviewed and approved. If your application contains no mistakes, you will be notified once you are approved to get licensed as a California money transmitter. To become licensed as a money transmitter in California, you will be asked to submit a surety bond. The amount of your bond is determined by the types of services you will be providing. Licensees that sell or issue payment instruments or stored value are required to obtain a bond in the amount of at least $500,000 or equal to 50% the average daily outstanding payment instrument and stored value obligations in the state. Whichever is greater of these two is the amount of your bond, though not higher than $2,000,000. Licensees that receive money for transmission must have a bond “in an amount greater than the average daily outstanding obligations for money received for transmission” though no less than $250,000 and not more than $7,000,000. It is important to note that the amounts required in both of these cases are cumulative! The amount of your bond is not the same as its cost, though. The cost of your bond is determined by your surety when you apply. The surety will use your personal credit score as its main point of reference when determining your rate. It may also request to review business and personal financial statements, as well as other relevant financial information to properly determine the cost. Applicants who have a high credit score, one of 700 FICO or more, can expect to get bonded at the lowest possible rates for their bond. You can easily request a free and exact quote on your bond through our bond application form. If you have any questions about this bond, call us at 877.514.5146!